A cold-blooded murder by the UVF in broad daylight on the Shankill Road on Friday has challenged British propoganda about the loyalist paramilitary ceasefires. The PSNI have vowed to further increase their fortifications in the North after republican armed group Oglaigh na hEireann (ONH) launched a mortar rocket attack on a PSNI barracks in Derry in Friday. Sinn Fein has warned the PSNI it may consider its levels of co-operation unless a row involving a former Catholic priest is resolved. The North’s new Attorney General John Larkin has ordered that a new inquest be held into a controversial British army ‘shoot-to-kill’ case. Thousands of lone parents whose youngest child reaches 13 will no longer be able to claim one-parent family payments under a new Social Welfare bill that has been slammed as “harsh” and “heartless” by unions and opposition parties. An action alert to hold Israel to account over the murder of international human rights activists and the hijacking of their aid flotilla. Prison reform which was painfully won by people, most of whom in normal society would not have been in prison at all, must not have to be struggled for again because of the unwillingness of those in authority to recognise reality inside prisons, or out of them. A senior loyalist paramilitary was shot dead at point blank range by masked gunmen this afternoon on the Shankill Road in Belfast. Twelve years after the inquiry began, the Saville report into the Bloody Sunday massacre in Derry will finally be published on June 15. Republican Liam Hannaway has ended his hunger strike at Maghaberry prison following intensive efforts to resolve his dispute with prison authorities. 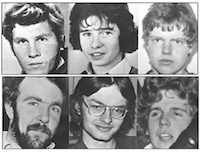 Official reports into British Crown force “shoot-to-kill” murders in the Six Counties should be released to the victims’ families, the High Court ruled today. The family of prominent County Armagh republican Colin Duffy have challenged a decision banning them from visiting him in jail. The failure of government health officials in the 26 Counties to ascertain the number of children who died in state care since 2000 is “genuinely frightening”, Amnesty International warned today. The so-called ‘culture minister’ for the Six Counties, the DUP’s Nelson McCausland, has sent an extraordinary letter to museum chiefs in the North asking them to give more prominence to alternative views on the origin of the universe, Ulster-Scots and the Orange Order. The address by Sinn Fein Deputy First Minister Martin McGuinness to a North South Consultative Conference in Farmleigh in Dublin on Wednesday. The disintegration of British union supporters in Ireland has come not from their opponents outside but from their friends inside. A Six-County Attorney General, John Larkin, was appointed today [Monday], the first to hold the post since 1973. There have been outbreaks of trouble at so-called ‘peace lines’ tonight [Monday night] in both Derry and Belfast. The ‘Grand Master’ of the Orange Order has said a single unionist party is needed to prevent a united Ireland, while a leading member of the SDLP has withdrawn a surprise statement calling for a single nationalist party in the North. The threat of cuts imposed by the new Tory Prime Minister, David Cameron, has brought together the leaders of the devolved Assemblies in Belfast, Edinburgh and Cardiff. The DUP ‘Minister for Culture’ in the Six Counties, Nelson McCausland has rejected a call by Taoiseach Brian Cowen for the centenary of the 1916 Easter Rising to be commemorated both north and south of the border. In an excerpt from her memoirs, Nora Connolly O’Brien talks about her father’s final days and the courage and inspiration that James Connolly gave to her and continues to give today. A Historical Enquiries Team report into the British/loyalist multiple killing of three south Armagh brothers in 1976 has finally confirmed that the murders were purely sectarian. The Six-County Minister for Justice David Ford has made an official visit to Maghaberry as tensions continue to rise inside the high-security jail. The Stormont Deputy First Minister, Sinn Fein’s Martin McGuinness, says he doesn’t believe the change of government in London will have a negative impact on the peace process. Up to 785 people are set to lose their jobs in Ireland after the pharmaceutical giant Pfizer announced a major restructuring of its manufacturing business. 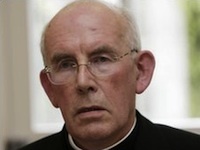 The head of the Catholic church in Ireland, Cardinal Sean Brady has indicated he has decided to stay at the head of the Irish Catholic church despite an unprecedented scandal over clerical child abuse and a subsequent cover-up by the church hierarchy. 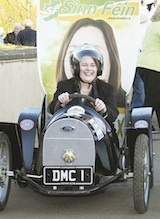 A campaign is mounting in Donegal against a tax imposed by the Dublin government on cars purchased in the Six Counties. There are 32 republican prisoners in Roe House in Maghaberry Prison living in appalling conditions and one prisoner, Liam Hannaway, has been on hunger strike in another part of the prison for the past month. We have had some pretty ropey proconsuls here in the last thirty-eight years. The signals from the latest one are not good. 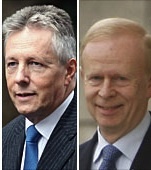 Ulster Unionist Party leader Reg Empey has confirmed he is to stand down in the autumn and has called on Peter Robinson to consider his position as head of the DUP. 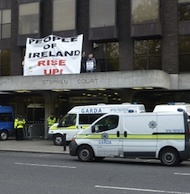 Four members of eirigi held a peaceful protest on the outer porch of Anglo Irish Bank’s headquarters in Dublin before they and three supporters were attacked and injured by members of the Garda police. 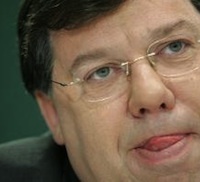 The 26-County Taoiseach Brian Cowen has been strongly criticised following a speech in which he sought to justify his actions as Minister for Finance and Taoiseach while acknowledging that he played a part in the economic crash. 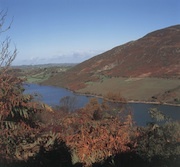 The new British Conservative Direct Ruler, Owen Paterson, has held out the prospect of allowing the the Six-County Assembly to make some tax varying decisions. The 26-County of Foreign Affairs has said a British bid to claim jurisdiction to the distant Irish island of Rockall is a “stunt”. It is crucial that the new Northern Ireland Secretary of State Owen Paterson ensures that the Saville Inquiry findings into Bloody Sunday are published without any further delay. Owen Paterson, the Conservative spokesman on the North of Ireland, has been appointed the North’s new ‘Secretary of State for Northern Ireland’ in British Prime Minister David Cameron’s new coalition cabinet. Protestors at Tuesday night’s ‘Enough is Enough’ march, called by the Right to Work campaign, were subjected to a sudden attack by panicked Garda police outside the Dublin parliament. The loyalist killers of 15-year-old Thomas Devlin were described as having “deeply ingrained sectarian attitudes” towards Catholics by the judge as he sentenced them to a minimum of 30 years and 22 years respectively. 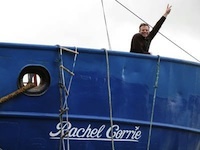 The first ship of an international flotilla aiming to break the Israeli blockade on Gaza and deliver humanitarian aid to the strip is being held up in an Irish port, apparently because of an Irish tricolour painted on its side. ‘Head shops’ selling ‘legal highs’ from their shelves all around the 26 Counties closed their doors or withdrew most of the products from their shelves following the announcement of new legislation to ban the sale to the public of a list of chemical compounds this week. 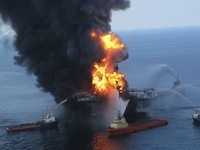 Responding to an oil spill may be easy and simple, but not at all cheap. And BP is cheap. Deadly cheap. 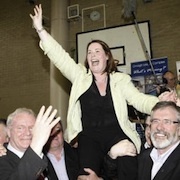 To help Bobby Sands, republicans came in from all over Ireland; they did the same for Michelle Gildernew. David Cameron has become the first Tory British Prime Minister in thirteen years after a sudden announcement by Gordon Brown tonight that he was standing down. Disturbances are continuing inside Maghaberry prison in County Antrim amid concern by families of the prisoners that the situation inside the jail is increasingly dangerous and combustible. The DUP says it “stands four-square behind Peter Robinson” to continue as party leader and First Minister following a party meeting at Stormont. A nationalist family in Derry city’s Waterside says they’re being hounded out of their home by repeated sectarian attacks. The publication of a Frontline human rights report on the Corrib gas dispute is a damning indictment of human rights abuses that have been suffered by campaigners against a high-pressure gas pipeline and refinery on the coast of county Mayo. 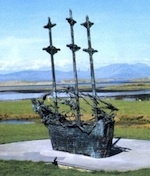 The loss of two million Irish people through starvation and emigration is to be remembered in Mayo this week when the second National Famine Commemoration’s programme opens today [Monday]. In Britain, the outcome of the Westminster general election has brought uncertainty and instability, with the possibility of a second election within a year. The British electorate has not so much spoken as seemingly held its political nose, by delivering its most remarkable election result since 1929. There is scepticism that Liberal Democrat leader Nick Clegg will forge a deal with the Conservatives this weekend after the British election produced a hung parliament. Despite a major PSNI offensive against republican militarists ahead of election day, a ‘viable’ pipe bomb left outside an election count centre in Derry interrupted counting for several hours early on Friday morning. A member of British military intelligence (MI5) has given evidence from behind screens in the trial of three County Armagh men charged in connection with what is alleged to be an international plan to import arms by dissident republicans. Bloody Sunday campaigner Johnny Duddy died in Derry this week aged 87, with still no date set for the release of the inquiry into the killings. The number of Irish people emigrating to the US increased by 12 per cent last year, and there was also a slight increase in the number of people from the 26 Counties registering to live and work in Britain in 2009, according to new figures compiled by the US and British authorities. The election results from all of the North's 18 Westminster constituencies. Each time a republican activist is labelled a criminal, particularly by those who were republicans in the era of Bobby Sands, it is a sleight on the enormous sacrifice made by him and his comrades. Sinn Fein’s Michelle Gildernew has remarkably retained her Fermanagh-South Tyrone seat by four votes after a third recount. After two recounts at the Enniskillen count centre, Sinn Fein’s Michelle Gildernew is ahead by just two votes over unionist unity candidate Rodney Connor. Sinn Fein could take over the DUP to become the largest party in the Six Counties on vote share, according to early estimates from the Westminster election counts this morning. 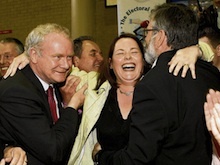 The result of the election in east Belfast has delivered a major shock with the defeat of DUP leader and First Minister Peter Robinson by Naomi Long of the Alliance Party. The result of the Westminster election is still completely unpredictable despite a major exit poll released at 10pm tonight. A slightly higher turnout of the North’s electorate is predicted in today’s Westminster election following early reports from the polling stations. 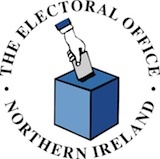 Sinn Fein has attacked the “blanket denial” of postal and proxy vote applications by the Electoral Office in some areas of the North. 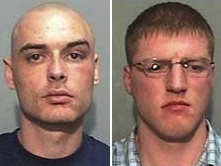 Two men convicted of a controversial abduction by the Provisional IRA have said the PSNI have since tried to set them up using a paid informer. About nine hundred staff at Quinn Insurance Ltd will be made redundant over the next 12 to 15 months as part of a major restructuring of the business by its joint administrators. A Limerick jobs centre funded by the 26-County Administration body FAS has had to be be ordered to stop promoting careers in the British army, a criminal offence under the 26-County Defence Act of 1954. The United Independent Hunger Strike Commemoration took place without major incident on Sunday despite passing the loyalist Shankill Road area en route from Belfast city centre to west Belfast. Gerry Ryan, one of Ireland’s most successful broadcasters, died unexpectedly on Friday morning. 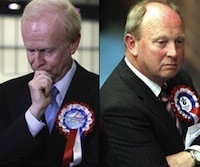 A guide to this week’s political showdown in the North and what to watch for when the newsflashes come rolling in. Sometimes a politician says something and an issue that’s been swirling around in the public consciousness suddenly takes on a clear, sharp form.